We seldom have steak weekends but when we do, it’s massive. We had steak for 3 consecutive meals! Fish used to be a staple in our household ( It still is actually. You can say that Mummy promotes sort of a “healthy eating” lifestyle at home with her healthy dishes such as fish, tofu, vegetables and occasional appearance of beef, chicken, pork and seafood. Meals that involve slabs of steak are usually reserved for dine outs and special occasions rather than dine-ins. Me and my sis grew up on Mum’s home cooked food but that said, we still love our red meat!! It’s even more fun now with the addition of the boys who can help clear up the “leftovers” ( I mean extra) meat that was prepared. 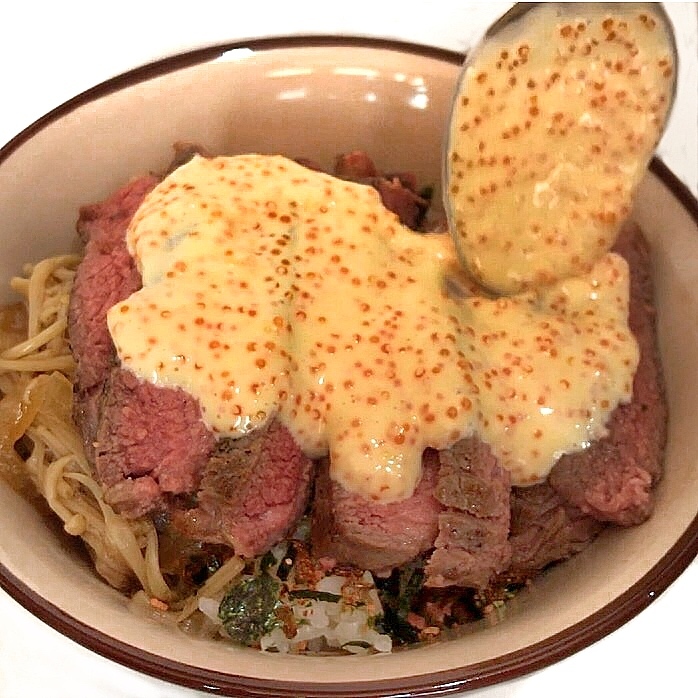 This Japanese Beef bowl was inspired by Red Rock, a Japanese eatery in Tokyo that specialises in roast beef as well as steak. The first time we had it, we were hooked! We had it a total of hmm 8-9 times in our 2 trips to Japan. Amazing right. Who goes to the same restaurant 4-5 times on a vacation. Yup.. that’s us. The bowl consist of a layer of Japanese Rice, topped with Enoki mushroom onion gravy ( I use a mixture of Gyudon, teriyaki sauce, Teriyaki Honey and soy). I just added them to taste with an equal proportion of water. I guess if it’s too salty, you can add water and if it’s too diluted, just add more sauce. Depending on how salty or strong you want the flavor! I then sprinkled a little Mentaiko Furikake seaweed over ( This mix is rather salty.. you can get it in a packet at Liang court or the Japanese section of any supermarket). I use this mainly for aesthetic purposes. Haha Then of course the most important part…. The steak! 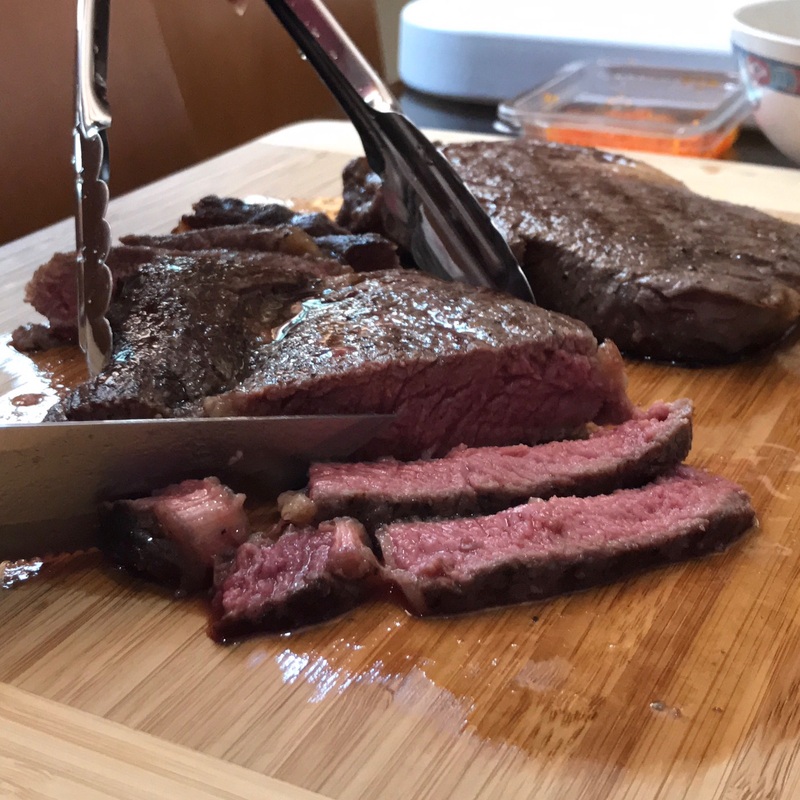 Sous vide steak cooked at 127deg C and seared for 15secs on each side. I then thinly slice the steak and added it to the bowl. Top with a mixture of tobiko mayo and torch till bubbly… You will love this part the most as it blends everything together. Certainly a match made in heaven! Can’t wait to try this on other proteins! Hope you enjoy the recipe! 2) Repeat this process 4-5 times. 4) Transfer rice to rice cooker and add water. 2) Heat up sous vide machine to the correct temperature. 125F in this case (For ribeye/ Sirloin) and 127F ( Tenderloin). 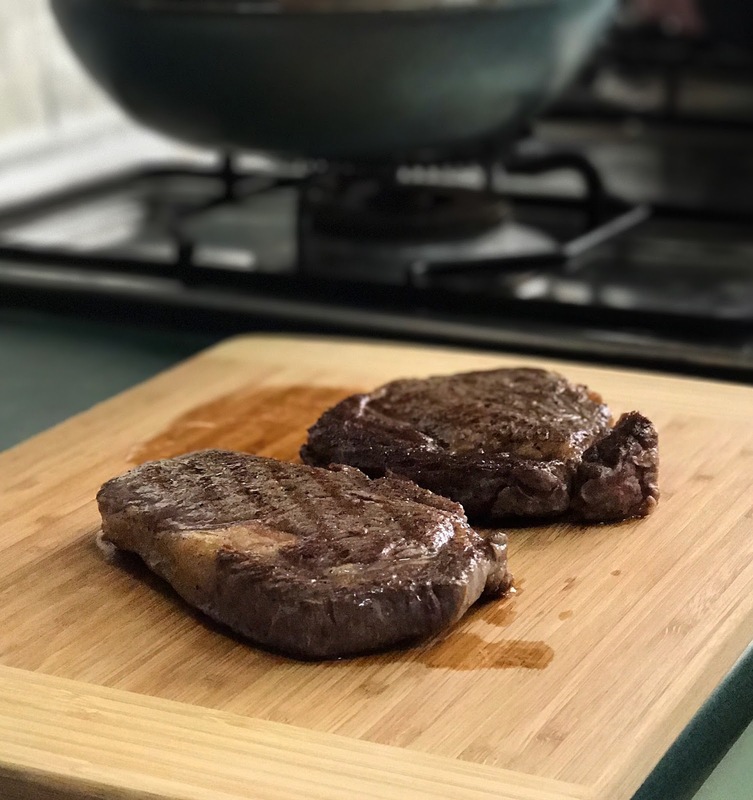 4) Place bag into sous vide machine for about 45mins ( Ribeye and Sirloin which is about 1″ thick) or 35mins ( Tenderloin which is about 1.5″-2″ thick). 7) Add steak and sear on each side for 15 secs until brown. 9) Serve over Japanese rice or just enjoy it plain! Mix some tobiko roe with japanese mayo. Spread it across the cooked steak and torch the surface until bubbly when ready to eat.